Sharn Wordley and Rye Val De Mai. Photo Credit ©AnneGittinsPhotography. Wellington, FL – December 12, 2018 – Sharn Wordley of Wellington, FL secured top honors in the $25,000 #1 Education Place Grand Prix at Palm Beach International Equestrian Center (PBIEC) on Sunday. Wordley took top honors riding his own Rye Val De Mai, a 2005 Selle Francais stallion (Helios Da La Cour II x Type D’Elle), dashing in at 42.222 seconds. Carlos Quinones of Wellington, FL earned second place riding Satoyama, a 2006 gelding owned by Michelle Navarro-Grau, stopping the timers in 43.581 seconds. 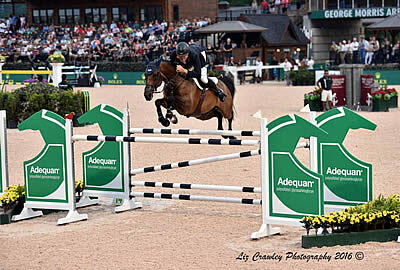 In addition to his first-place win, Wordley captured third place with his own Gatsby, a 2004 Irish Sport Horse stallion (Simba x Cruise On), completing the course in 44.256 seconds. On his first-place finish, Wordley stated, “It was a good trip [for Rye Val De Mai]; he jumped really well. He’s had a bit of time off so he’s just come back. Rye could have gone a bit faster, but it wasn’t that fast of a class. He jumped great. I was really happy with him. With Rye, I wanted to make sure that I won it. Sharn Wordley on Famoso D’Ive Z.
Lexington, Ky. – Aug. 7, 2017 – Despite Great Britain’s Amanda Derbyshire and Sydney Shulman both earning 310 points during the Kentucky Summer Classic, Sharn Wordley continues to lead the 2017 Hagyard Challenge Series after the Kentucky Summer Classic came to a close. The Kentucky Summer Classic also featured the sixth event of the series for the 2017 USHJA National Hunter Derby sponsored by the World Equestrian Center and Kentucky Horse Shows, LLC, where Jeff Gogul continues to maintain his place at the top of the rankings. Sydney Shulman, who earned the blue ribbon during Thursday’s $25,000 Hagyard of Lexington Grand Prix put her within 10-points of Pablo Barrios, who currently sits in third place and only 60 points behind Derbyshire who is second to Wordley. The New Zealand Olympian currently has 410 points. The Kentucky Summer Classic also featured a $5,000 USHJA National Hunter Derby, sponsored by the World Equestrian Center and Kentucky Horse Shows, LLC. Jeff Gogul has earned the top spot in five of the six of the events so far and is dominating the standings with 1,200 points. Behind Gogul is David Beisel with 750 points is and Victoria Colvin with 475 points. Sharn Wordley competing Famoso D Ive Z.
Lexington, KY. – July 26, 2017 – On the opening day of the Kentucky Summer Horse Show, the Rolex Stadium played host to four show jumping classes that offered combinations the opportunity to warm up for an upcoming week of competition. David Beisel of Cincinnati, Ohio and Sharn Wordley of New Zealand both achieved blue ribbons and set themselves up for a successful week of showing at the Kentucky Horse Park. 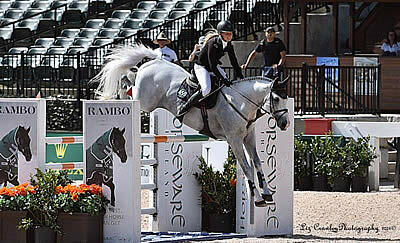 Beisel and Colato Sabata were the fastest of seven entries in the 7-Year-Old Developing Jumper class, presented by Spy Coast Farm. The chestnut gelding navigated the first portion of the power and speed class with no faults, allowing him to move on to the speed phase, where he was also clear in a time of 33.094. In addition to Colato Sabata, Beisel rode two other entries in the class, which made for an exciting hour as he quickly dismounted one horse just to mount another that was being held for him at the ingate. New Kentucky resident, Sharn Wordley, also found success in the Rolex Stadium on Wednesday afternoon in the $5,000 Open Jumper 1.40m Speed class, besting a field of thirteen other competitors with his gelding Famoso D Ive Z. The pair completed the course, designed by Oscar Soberon, in a time of 62.934, a full three seconds faster than the next fastest competitor. On the opening day of the Kentucky Summer Horse Show at the Kentucky Horse Park, top hunter competitors were eager to head into the Stonelea Ring to kick off competition. On Wednesday morning, Tim Goguen aboard Belhaven Stables LLC’s Perhaps led the way in the Green 3’6″/3’9″ Hunter division after placing second in the first over fences round, winning the second over fences round and placing third in the under saddle. Goguen rode the talented gelding to a handful of championship titles at the Winter Equestrian Festival earlier in the season and he has mainly competed in the Pre-Greens. Robert Crandall and On the Slye are following behind in the division standings after winning the first over fences round and earning a red ribbon in the second round. In the High Performance Conformation Hunter division, Kathryn Haley of Colts Neck, New Jersey won both over fences classes on Outshine, a 9-year-old Warmblood gelding owned by Alexandra Worthington. The pair placed second in the under saddle behind Jeff Gogul and Cortese. Hunt Tosh and Flamingo-K. Photos ©Sportfot. Mill Spring, NC – July 7, 2017 – Hunt Tosh of Milton, GA and Flamingo-K, owned by Ceil Wheeler, finished as the winning pair in the $50,000 USHJA International Hunter Derby at the Tryon International Equestrian Center (TIEC). The duo were tied for second place after the first round with a combined score of 177 and turned in another strong performance in the handy round, earning a score of 200, for a total score of 377. Harold Chopping of Southern Pines, NC and Celtic Gold, owned by Meg Valnoski, secured the second place honors with a two round total of 368, while Jennifer Hannan of Wakefield, RI and Olympic Fire, owned by Roger Smith, rounded out the top three with a score of 363. Tosh and family made a special trip to TIEC for the weekend, bringing only Flamingo-K to contest the duo’s abilities in this very class. Navigating the handy round with precision and beauty, the duo ended the day with a blue ribbon, proving the journey to be well worth their travels. Tosh and Flamingo-K have only been partnered for a short time and this was Tosh’s second class with the 12-year-old chestnut gelding. Although the mount is rather new, he spoke very highly of the horse’s ability to perform in the big George H. Morris Arena. Tosh’s daughter, Maddie Tosh, competed multiple mounts in last weekend’s $10,000 USHJA Pony Hunter Derby. Tosh had never showed in this arena and therefore relied on his daughter’s insight for the class. “The best part about Maddie is that she is so hands on in the barn and she knows all of the horses just as well as I do and everything about them. I told her tonight she would have to give me pointers on how to show in this ring because I have never shown in it before! So I asked her how it rode and for her advice,” laughed Tosh. Todd Minikus of Loxahatchee, FL and Exceptional were just that in the $15,000 USHJA National Hunter Derby at TIEC. Minikus and Exceptional bested twenty-six other pairings with phenomenal scores of 92 and 96, capturing the win by more than ten points with a final score of 188. Taylor Ann Adams of Ocala, FL and Lucretia finished in second place with a two round score of 177.5, while Kianna Luscher of Hawthorne, NJ and Carissima W took third place with 175 points after two rounds. Minikus explained that he wasn’t sure how to approach the inside turns for the handy round in particular with this horse, and needed to improvise a bit on course, which Exceptional, owned by Todd Minikus LTD, handled with ease. The pair has been together since midway through the Winter Equestrian Festival (WEF) circuit in Wellington, FL when a friend of Minikus found Exceptional in Belgium and connected the two. A six-year-old bay gelding, Exceptional has only done six or seven shows in his career. “He was champion both this week and last week, so he’s turned himself into a real winner,” said Minikus. “We make our living selling horses, so hopefully somebody wants to have a winner and buys him from me, but until that time, I’ll continue to show him in his prospective division and these derbies. Hopefully we’ll keep winning,” he added with a smile. Sharn Wordley (NZL) and Famoso D Ive Z topped the $6,000 Nutrena® 1.40m Classic CSI 3* on the Grass Complex at TIEC, stopping the jump-off timers at 37.09 seconds. Kyle Timm (CAN) and Georgie B sped to second with a 38.179 second dash, while Erynn Ballard (CAN) took third place aboard Thalys Z, stopping the timers in 39.845 seconds. Famoso D Ive Z, a 2007 Zangersheide gelding (For Pleasure x Chin Chin) owned by Sky Group & Sharn Wordley, has been with Wordley for two years now and the pair have amassed an impressive record together. In the last year, Wordley and Famoso D Ive Z have won seven ranking classes together at TIEC alone and Wordley emphasized that he is an important horse in his successful string. “He wins a lot of classes. He’s fast. He does the ranking classes to save the grand prix horses or if there’s a grand prix that’s appropriate to him. He’s a good horse and very fast. For more information on Tryon International Equestrian Center (TIEC), please visit www.tryon.com. Sharn Wordley and Casper. Photo ©Sportfot. Mill Spring, NC – October 29, 2016 – Sharn Wordley (NZL) and Casper made a quick dash to the finish in the $130,000 Asheville/Greenville BMW Centers’ Grand Prix CSI 3* at Tryon International Equestrian Center (TIEC) to top the final FEI Grand Prix of the season at the venue. Wordley and Casper bested the class after crossing through the timers in 40.614 seconds, while Conor Swail (IRL) and Hetman of Colors took second place with a time of 42.372 seconds. Wordley then added to his first place finish, taking third place honors aboard Barnetta after completing the jump-off track in 43.37 seconds. Wordley was one of two riders to bring back two mounts for the jump-off alongside Hardin Towell (USA) who finished in fourth and fifth, respectively. Aboard Casper, Wordley fought to outpace Swail and finished the course nearly two seconds ahead of the leading time. The class saw 36 original entries take to the first round in George H. Morris Arena, while nine combinations progressed to the jump-off round. Guilherme Jorge (BRA), who led course-designing responsibilities at the 2016 Olympic Games in Rio de Janeiro, built both tracks. Attesting to the difficulty of the jump-off track, Wordley noted that both of his horses handled the pressure of the second round with ease, but also jumped exceedingly well in the first round, which set both horses up for a strong finish. Touching on the differences between Casper, a 2006 Oldenburg gelding (Contender x Baloubet du Rouet) and Barnetta, a 2004 Westphalian gelding (Baloubet du Rouet x Polydor), both owned by Sky Group, Wordley discussed his unique approach to each horse as they both take a different style of ride in the jump-off. The conclusion of the class marked the end of international show jumping at the facility for the 2016 season. Wordley leaves TIEC as one of the most decorated riders at the venue this year, guiding his string to more than fourteen top five finishes in FEI competition. Wordley took a moment to reflect on his achievements and explain what makes this venue so special to him as a competitor. Casper and Barnetta have proven to be influential mounts for Wordley, who has represented his home nation of New Zealand well in major FEI competition this season, currently sitting in 57th on the FEI World Ranking List. Margo Thomas, Wordley’s groom, was recognized for her passion and hard work as the recipient of the Grooms’ Initiative Award presented by Tryon Equestrian Partners (TEP). Thomas oversees the care of Barnetta and Casper, playing an integral role as a valued member of Wordley’s team. Meg Atkinson of Town & Country Realty presented Tracy Fenney (USA) with the Leading Lady Rider Award for her success in FEI classes throughout the week aboard MTM Reve Du Paradis. The 2016 Tryon Fall Series presented by Greenville-Spartanburg Airport District offers six weeks of hunter and jumper competition, including three weeks of internationally recognized FEI show jumping featuring two FEI CSI 3* weeks and an FEI CSI 5*. For more information on Tryon International Equestrian Center (TIEC) and surrounding amenities, please visit www.tryon.com. Scott Stewart and Storm Watch. Lexington, Ky. – August 17, 2016 – Scott Stewart guided Rivers Edge’s Storm Watch into the new leading position on the second day of the USHJA Pre-Green Incentive Championship with a total of 520.5 points. Storm Watch is a 6-year-old Oldenburg by Chacco Blue, and even as a relatively new addition to the River’s Edge team, he has made his mark at the Kentucky Horse Park during the Bluegrass Festival Horse Show. The gray gelding placed fifth over the Patrick Rodes-designed course, after being tied for second place Tuesday. Stewart’s plan for Thursday’s third and final round of the USHJA Pre-Green Incentive Championship will be simple and straightforward. “He’s pretty laid-back, so I only jump a few verticals before I go in. He’s brave, so I’m not going to do too much. He’s pretty quiet as well,” Stewart said. While Storm Watch is currently in the lead overall, it was Tim Goguen and Davidson that captured the blue ribbon during the second over-fences round of the USHJA Pre-Green Incentive Championship. Goguen was quick to mention that Davidson really tries to give it his all in the show ring, and that is what helped him both days. Davidson, a homebred warmblood, has only been showing under the expertise of Goguen since the end of June. Despite their short time together, Davidson has made it to the winner’s circle every time out. Davidson enters Thursday’s phase in the ninth place position, with a total of 513.5 points. Dr. Betsee Parker’s Liberty Road is now in second place overall with 519 points. Chicago, owned by Douglas Wheeler, narrowly missed the second place spot with 518 points. Both horses were ridden by esteemed hunter rider, Hunt Tosh. On Wednesday afternoon, a new winner for 2016 will be crowned as the championship will culminate after the top 30 horses battle it out for the coveted title. The course walk for the third and final round is set to begin at 3:15 p.m. and officials can begin walking the course at 4:15 p.m. The opening ceremonies will take place at 4:30 p.m., and the championship round is planned for a 5 p.m. start. As the jumper action began on Wednesday in the Rolex Arena, it was Sharn Wordley and Glamour Van De Kakebeek who brought home the blue ribbon in the $5,000 1.40m Open Jumper division at the Bluegrass Festival Horse Show. The Rolex Arena was filled with intricate sand sculptures, fully decorated and ready for the USHJA International Hunter Derby Finals, which begin on Friday. Despite the decorations and the light rainfall, Wordley and Glamour Van De Kakebeek navigated the course successfully, going clear in a time of 66.018 seconds. Wordley said that he got the ride on the Kerry Anne LLC entry two months ago, and has been showing the 10-year-old gelding to successful finishes in the 1.40m division. His goal is to eventually show the gelding in FEI ranked classes. The gelding was previously owned by Darragh Kenny, who alerted Wordley when he realized the two would be a great match. Finishing second to Wordley was another rider known for his speedy rounds – Aaron Vale. Vale turned in a clear round aboard Acolina R, tripping the timers just behind Wordley in 66.871 seconds. With a time of 67.328 seconds, Wordley also came in third with Caiman De Sequoias, who is owned by Sharn Wordley and The Sky Group. Earlier in the day, the 1.35m Open Jumpers had the stage in the Rolex Arena, and it was Richard Rinehart and Virginia Bartholomay’s Donnalaris who swept the field of 32 entries to earn the win. Rinehart, who is based in Indianapolis, said he began riding the 8-year-old mare during July of last year. The Bluegrass Festival Horse Show will resume on Thursday with the finale of the USHJA Pre-Green Incentive Championship. Other highlight events include the 2016 USHJA International Hunter Derby Championship, which will take place over the course of two days, and the $5,000 Hallway Feeds USHJA National Hunter Derby. Jumper highlights include the $25,000 Hagyard Lexington Classic, and the $40,000 Bluegrass Festival Grand Prix, sponsored by Audi of Lexington. For more information, please visit www.kentuckyhorseshows.com. Sharn Wordley and Famoso D Ive Z. Photo ©LizCrawleyPhotography. Mill Spring, NC – July 20, 2016 – Sharn Wordley (NZL) and Famoso D Ive Z have established an impressive record this season at Tryon International Equestrian Center (TIEC) and the duo recorded another win at the venue, taking the $35,000 1.45m Horseware® Ireland Opener at Tryon Summer IV with ease. Wordley and Famoso D Ive Z completed the track in 36.223 seconds, ahead of Samuel Parot (CHI) and Couscous Van Orti, winners of the $35,000 1.50m Suncast® Classic at Tryon Summer III. Alise Oken (USA) and Belmont earned third place, finishing in 42.625 seconds. Wordley and Famoso D Ive Z started off this season looking to gain experience together at the FEI levels and establish a strong relationship that would make them competitive at the top tiers of the sport. The 2007 Belgian Warmblood gelding (For Pleasure x Chin Chin) owned by Sky Group & Wordley, has greatly surpassed the expectations of Wordley and their goals coming into this season, as he now looks to be top contender at the international level. Catsy Cruz (MEX) will design this week’s FEI tracks and competition saw 27 entries, while 10 combinations moved forward to the jump-off round. “It flowed very well and there were some tough questions that created some challenges out there. It was easy to pull a rail down, but it also wasn’t tremendously big,” he added. The pair went late in the jump-off order, allowing Wordley to analyze the course, as well as previous competitors before he entered the ring. Noticing that multiple combinations were exiting the difficult one stride combination with a rail, Wordley turned his focus to that specific component of the course. Their victory marked Wordley’s seventh win at the facility this season as he currently has four incredibly talented mounts representing New Zealand at the international level. With three horses entered this week in FEI, Wordley will look to continue with the impressive consistency he has showcased this season, as well as improve on what seemed to be an off outing for his top mount Casper in the $216,000 Hollow Creek Farm CSI 4* Grand Prix. Wordley also plans to return to the venue during the 2016 Tryon Fall Series to contest the FEI CSI 5* with all three mounts. Competition at TIEC continues throughout the week, featuring the hunter and jumper disciplines, while FEI competition will resume Thursday in the George H. Morris Arena with the $35,000 1.50m Suncast® Welcome beginning at 8:00 a.m. For more information on TIEC, please visit www.tryon.com. Sharn Wordley and Famoso D Ive Z. Photos ©LizCrawleyPhotography. Mill Spring, NC – July 13, 2016 – Sharn Wordley (NZL) and Famoso D Ive Z claimed top honors once again, this time starting off Tryon Summer III at Tryon International Equestrian Center in the $35,000 1.45m Horseware Ireland® Opener CSI 4* with an impressive jump-off time of 34.969 seconds. Kristen Vanderveen (USA) and Bull Run’s Faustino De Tili, who have also finished with great results this season at TIEC, completed the course with a time of 35.339 seconds. Third place honors were awarded to Sarah Segal (USA) and Ubris, who stopped the clock in 35.587 seconds. Wordley and Famoso D Ive Z have continued to wow at TIEC, securing multiple victories and accumulating an impressive record throughout the 2016 Spring and Summer Series thus far. With 16 of 32 entries advancing to the jump-off, Wordley commented on the extraordinary competition in the feature class this morning and the consistent flow of the first round, saying, “There are a lot of good horses here for the CSI 4* week and for the first day it was a nice, easy going 1.45m course. “With that many advancing to the jump-off, there were a couple of really tough inside turns that you had to be a little lucky to make happen. You had to ride the turns well, which weeded out a few competitors. You had to hit them just right or they would slow you down,” he elaborated. Wordley and Famoso D Ive Z went relatively early in the order to contest their abilities in the jump-off, which pressured Wordley to lay down a speedy time. They were the only pair to finish under the 35 second mark, completing the course with a time of 34.969 seconds. Wordley and Famoso D Ive Z have been partners nearly ten months now and the Belgian Warmblood gelding (For Pleasure x Chin Chin) is only nine years old, with a bright future ahead. The gelding has won three $35,000 1.45m Horseware Ireland® Opener classes at TIEC and Wordley mentioned that he focuses on competition mileage with this horse in particular to gain more experience. “I have jumped him in some big classes for just being nine. Now he’s really beginning to step up his game and his education level is great. It doesn’t matter how talented they are; they must have a certain education level and capacity to compete in the big classes. Famoso D Ive Z is really starting to learn his trade and when he knows what he is doing, he is very hard to beat. “He has a big future that horse,” Wordley noted. Competition continues Thursday at TIEC, beginning at 8:30 a.m. with the $35,000 1.50m Suncast® Welcome. On Friday, July 15, the venue will feature a $10,000 USHJA National Hunter Derby, a $10,000 Pre-Green Hunter Incentive, and a $35,000 1.45m Speed Stake. This coming Saturday, July 16, TIEC will host another installment of the “Saturday Night Lights” Series presenting the $216,000 Hollow Creek Farm Grand Prix CSI 4* with gates opening to the public at 6:00 p.m. and entertainment beginning at 7:15 p.m. Competition will commence at 8:00 p.m. For more information about TIEC and to see a full list of results, please visit www.tryon.com. Sharn Wordley and Casper. Photos ©LizCrawleyPhotography. Mill Spring, NC – July 2, 2016 – Sharn Wordley (NZL) continued his dominance at Tryon International Equestrian Center (TIEC), taking top honors in the $130,000 Adequan® Grand Prix aboard Casper, dashing through the jump-off course in 41.694 seconds to secure the only double clear effort of the evening. Matthew Williams (AUS) and Valinski S finished in second place, collecting a single time fault around the short course to earn a finishing time of 42.645 seconds. Peter Wylde (USA) and Aimee crossed through the timers in 41.103 seconds, adding four faults to their score for third place. Wordley and Casper, who have continued to display their combined talent throughout the duration of the season, notched yet another victory at the venue. On a beautiful North Carolina summer evening, the pair exhibited their newfound confidence and finesse around a difficult course set by Oscar Soberon (MEX), which saw 30 entries attempt to advance to the second round. A small contingent of four combinations advanced to the jump-off round. The evening also drew a massive crowd attendance of more than 12,000 spectators, who visited the venue to experience and appreciate the best of equestrian sport. “There were four in the jump-off and I knew going in that all four could go quite quick. Casper is very careful. 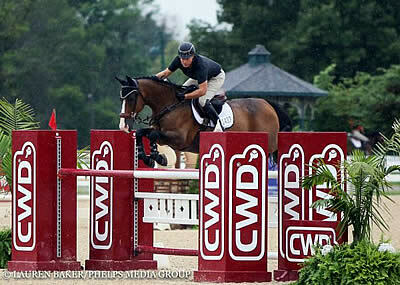 I’ve just been teaching him to jump the big jumps and we haven’t really gone fast at all,” noted Wordley. “Slowly, every time we’ve gone out, I’ve been asking him for just a little bit more, a second or two here and there. We’ve finished well and had some top placings. “I think he has another two seconds faster in him. We’re slowly teaching him to use that speed. I want to keep the confidence,” he added. Casper has quickly become a crowd favorite at TIEC, with Wordley piloting strongly from the irons. The duo drew second in the order-of-go and secured the first clear effort around the course, finishing just under the optimum time of 86 seconds. The opening track saw four technical combinations spread throughout the course, which created a sense difficulty in securing a completed round under the time allowed. “It helped us start the course a little bit smoother than I think taking the inside turn would be. I had to hustle along and it just worked. I thought he jumped really well on Thursday. We had a rail down and he doesn’t like to have rails down, so he felt very sharp today,” he added. “He was ready to go tonight. It felt great and it was a technical course, which I think he enjoys. It wasn’t overly big, but it was definitely technical and careful. They had to jump well. If they didn’t jump well they weren’t going to get around,” he detailed. The victory marked the pair’s fourth top five finish in FEI sanctioned competition in the past four months and their eighth top ten finish in the same time frame. Wordley has carefully educated Casper and has perfected the ride needed to be successful at the highest levels of the sport. “If you’ve noticed, we haven’t won too many, but I just felt really strongly about taking it slowly. He’s only ten and he’s won three grand prix classes now, but he’s been second in many more. I opted to go slower and again, focus on the confidence,” he commented. As the massive crowd of spectators descended upon the venue, eager to watch world-class show jumping, their presence intensified an electric atmosphere that offered only positive benefits for both the competing athletes and the sport as a whole. Peter Wylde (USA), an Olympic team gold medalist at the 2002 Athens Olympic Games, rounded out the top three finishers aboard Aimee, and in his first grand prix appearance at the venue, commented on the immense and positive response from the crowd. Wylde guided two horses to strong placings in the class and was impressed with performance of Aimee, a 2005 Dutch Warmblood mare (Solitair x Silvio II), who contested her largest class and handled the large atmosphere and added pressure exceedingly well. Wylde and Wordley both reiterated their excitement for the expansion of the sport, which has found a supportive and passionate audience base in the western Carolina region at TIEC. Wordley’s groom, Louise Gaytan, was awarded with the Groom’s Initiative Award presented by Mark Bellissimo and the Tryon Equestrian Partners, in honor and recognition of the dedicated and continuous work of the grooms and essential team members who make grand prix victories possible. Sarah Segal (USA), who finished in fourth place aboard Zelda, received the Leading Lady Rider Award presented by realtor Meg Atkinson, acknowledging the competition achievements of Segal throughout Tryon Summer I FEI competition. Competition at TIEC continues Sunday with the final day of Tryon Summer I. Classes will resume on Wednesday, July 6, with the start of Tryon Summer II, which will continue through Sunday, July 10. For more information and to see a full list of results, please visit www.tryon.com.